Hello friends! It's already the second Thursday in April. Can you believe it? This year is really going by so fast! I'm super excited about this month's One Stamp At A Time Blog Hop theme.... Pocket Full of Posies...isn't that fun??! 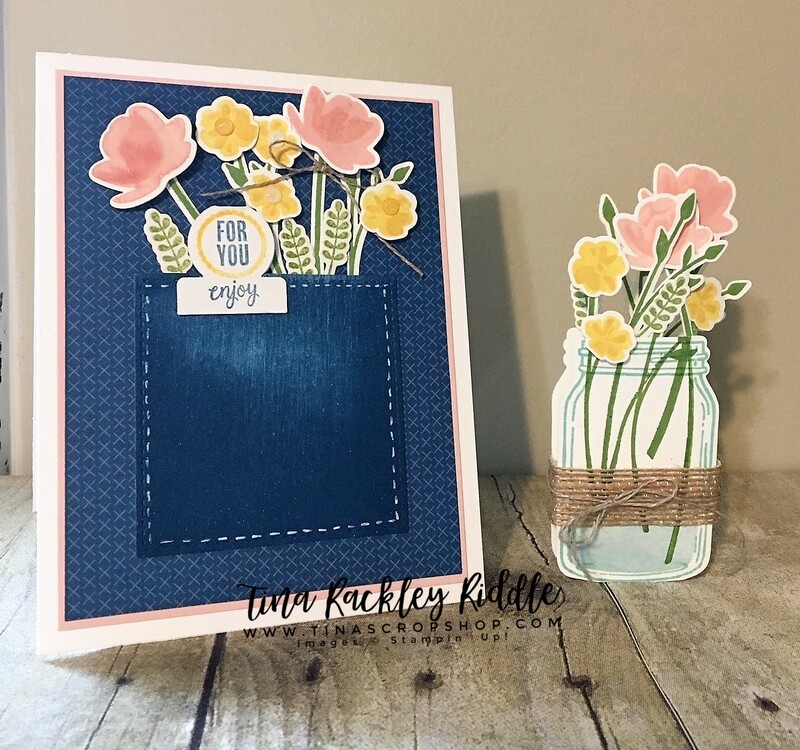 I love flowers and could have gone with many sets that would have been fun but I love the little flowers in the Jar of Love stamp set so I decided to use it! So I decided to go really literal with the pocket. 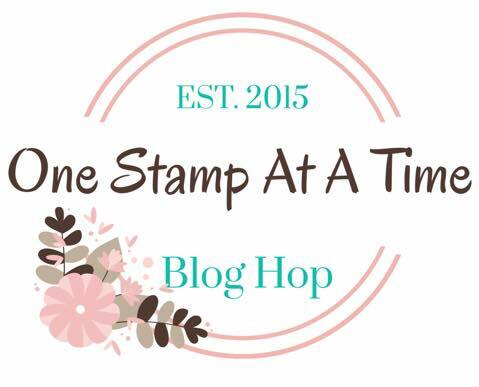 lol Stampin' Up! has an adorable pocket stamp and die set but I don't own it... what was I thinking? I'm sure I need it! So for my pocket I used the largest of the squares from the Stitched Shapes Framelits Dies. 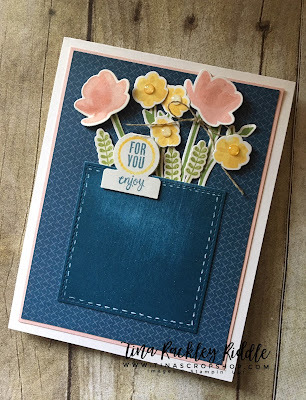 How do you like the cool denim look of the cardstock? Well I used a piece of white cardstock and ran my Dapper Denim Ink Pad right across it to make it, pad to paper, to get this look. Once the ink was dry I cut my square out. I used a white gel pen to draw in some stitches that showed up a little more than the stiches in the die. I used tear tape on the back of the square on the sides and bottom and attached it to a 3 3/4" x 5" piece of the Myths & Magic Specialty DSP. 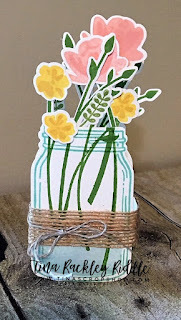 I then started stamping some of the flowers from the Jar of Love stamp set. The largest flower was stamped in Powder Pink for the light portion and Blushing Bride for the darker portion. 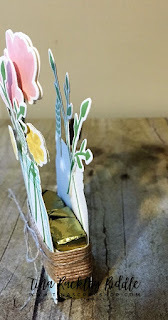 The small flowers were stamped in Daffodil Delight and So Saffron. The leaves and greenery were stamped in Wild Wasabi and Pear Pizzazz. I added some of the glitter enamel dots in the yellow flowers. For the Sentiment "For You" and "Enjoy" I used the Tabs for Everything Stamp Set and the Circle Tab Punch was used to punch it out. I adhered on both sides of the pocket with glue dots. I adhered the card front on a 3 7/8" x 5 1/8" piece of Powder Pink Cardstock and then mounted that on a Top Folding Heavy Weight Whisper White card base. Isn't the jar adorable. It's a treat holder as you'll see in the picture below. As you can see, I added a tab on the bottom. I also added one to both sides. I took a 3" x 3/4" strip of Whisper White Cardstock and scored it at 1", 1 1/2" and 2". I folded it and adhered the 1" sides to the back of each of the 2 cut jars with tear tape. I also added the same size tabs to each of the sides and adhered Burlap Ribbon with tear tape around it to hide the side tabs. I made sure that the Hershey Nuggets fit in snuggly before enforcing the adhesive on the tear tape. 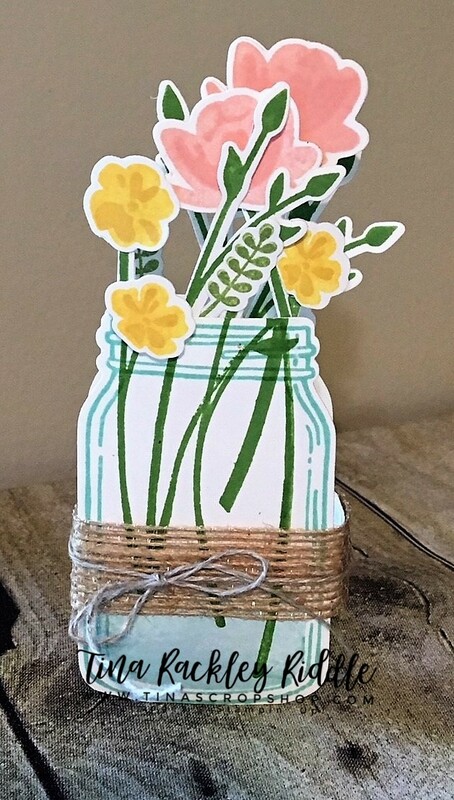 Once I was sure it fit, I cut the burlap ribbon right at the seam of the back of the front jar and tied some Linen Thread around it and tied it in a bow on the front. Thanks so much for stopping by! The Blog Roll is listed below.. just click on Melissa Davies name as she is next up on the hop and will likely have some super cool to share!